Magayon (the volcano) and her lover Panganoron (the clouds) must be together once again, smiling down as the Kabikolan region welcomes its to-be wed couples to the first-ever wedding fair in the City of Legazpi. Downcast skies turned bright as Kasalang Filipino in Legazpi's participating wedding suppliers went on a motorcade to promote the wedding event. Legend has it that the tragic love story of Daragang Magayon and Panganoron gave birth to the volcano. Magayon's grave became Mayon while the clouds kissing her is Panganoron. 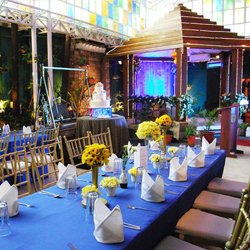 Pepperland Hotel, the Legazpi leg host, was transformed into a wedding wonderland as its own creative staff displayed different wedding setups in the hotel's lobby. 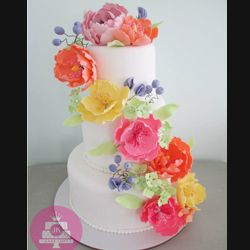 Renan Yulo of Round & Squares Pastries designed matching cakes for the Japanese, Boracay, and Filipiniana theme wedding setups. 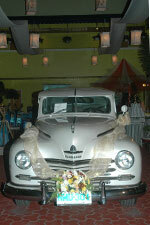 The Bichara brothers' vintage bridal car collection were also put on display at the hotel patio. 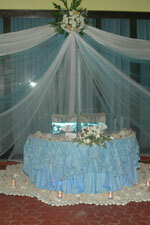 A mock wedding setup in downtown Pacific Mall complemented the wedding exhibit. Hotel. Outside of the hotel, various kiosks selling Albay's famous products were setup especially for tourists and out-of-town event guests. On the afternoon of the first day, fair guests were treated to a baking lesson/demo, courtesy of Round & Squares Pastries. Mary Kay beauty consultants also provided free hand spa to lucky visitors. On the second day, Ms. Ching Hondrado Sta. 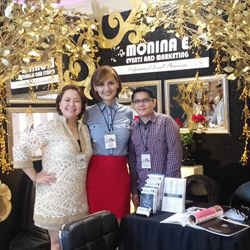 Maria of Blissful Moments, Legazpi's known event coordinator, coached to-be weds on how to plan their wedding. 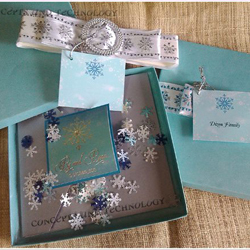 Kasal.com, on the other hand, provided interesting insights on local wedding trends. 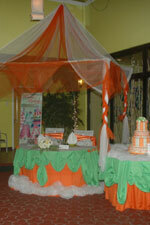 Kasalang Filipino in Legazpi wedding fair was capped with a special exhibitor recognition night. 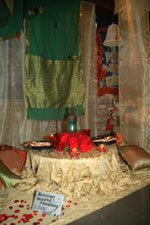 Outstanding booth designs were honored. 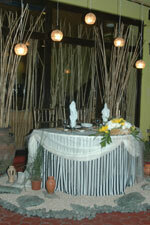 Green Leaf, one of the premier caterers in the City, bagged the best booth award with its island wedding setup. Blissful Moments received the second award with its Moroccan-inspired wedding display while RSVP Inc.'s florists & wedding planners took home the third prize with its garden wedding design. Pepperland Hotel prepared a special cocktails while local performers serenaded both exhibitors and to-be wed guests. Costa Verde Realty & Development Corp.